Did you feel that? Delaware was shaken by an earthquake today. As I chatted with co-workers, checked facebook and twitter, and read blogs, it became clear not many of us east coasters knew how to deal with an earthquake. Thankfully FEMA has a a guide for what do to before, during, and after an earthquake. They also have several other useful guides. 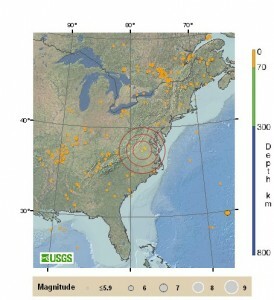 Virginia also seems pretty far away for an earthquake to be felt in Delaware. Check here if you are interested in knowing the differences between an earthquake on the east coast and one on the west coast.